Valine (abbreviated as Val or V) is an α-amino acid with the chemical formula HO2CCH(NH2)CH(CH3)2. L-Valine is one of 20 proteinogenic amino acids. Its codons are GUU, GUC, GUA, and GUG. 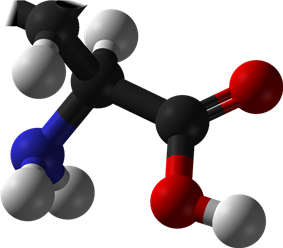 This essential amino acid is classified as nonpolar. Human dietary sources are any proteinaceous foods such as meats, dairy products, soy products, beans and legumes. 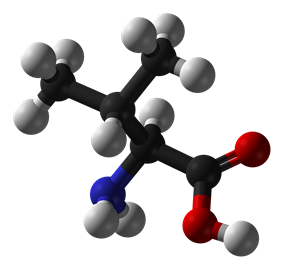 Along with leucine and isoleucine, valine is a branched-chain amino acid. It is named after the plant valerian. In sickle-cell disease, valine substitutes for the hydrophilic amino acid glutamic acid in hemoglobin. Because valine is hydrophobic, the hemoglobin is prone to abnormal aggregation. According to IUPAC, carbon atoms forming valine are numbered sequentially starting from 1 denoting the carboxyl carbon, whereas 4 and 4' denote the two terminal methyl carbons. ^ Weast, Robert C., ed. (1981). CRC Handbook of Chemistry and Physics (62nd ed.). Boca Raton, FL: CRC Press. p. C-569. ^ Marvel, C. S. (1940), -Valine"dl", .